March | 2015 | The British in Crete, 1896 to 1913. Know your allies? Another minor puzzle. 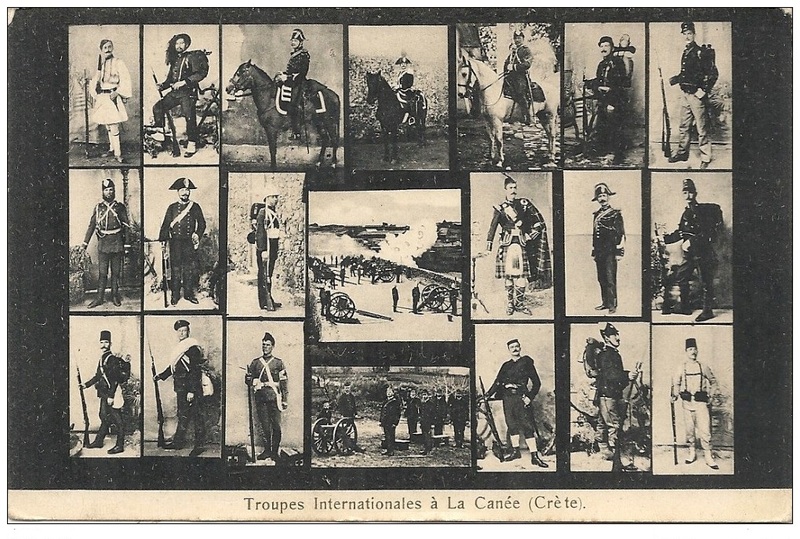 The undated postcard above shows International troops based in Canea. However, it also appears (top left) to show a Greek Evzone. The Greek army were never part of the International force on Crete; their presence on the island was the reason for the international intervention in the first instance and they were evacuated in May 1897 after a stay of four months. The card also apparently also shows (bottom left and bottom right) Ottoman soldiers. 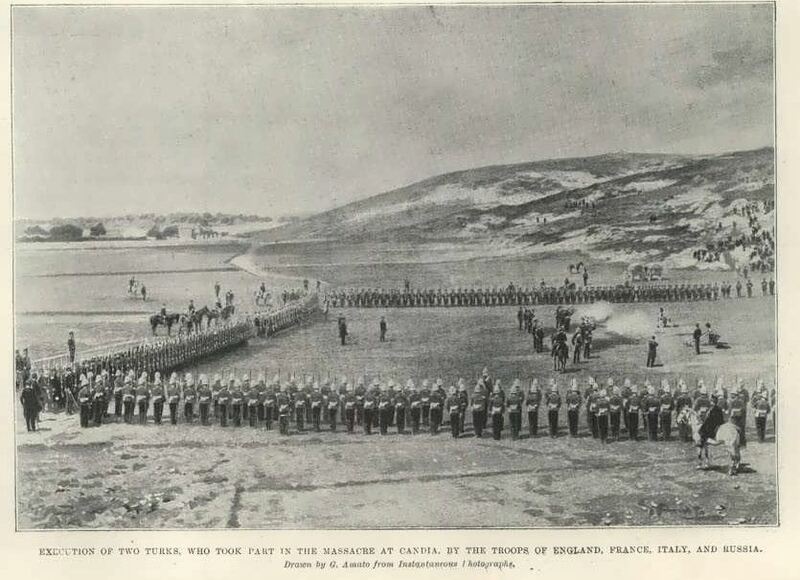 While the Ottoman troops were on the island until November 1897, they were not usually considered to be part of the International intervention. A similar post card to the one at the top of the page although the elements are in a different order. The problem with this card is that it cannot be an accurate depiction of the date it purports to represent: 1896. Foreign troops, other than Ottoman ones, didn’t arrive on Crete until February 1897. Leaving aside the question of who plagairised whom, dating the cards is a problematic. Clearly the images were produced between 1897, when the international troops arrived, and 1904, the date on the franked stamp. However, assuming the images are of troops who served in Crete, the presence of a highland piper can assist since only two kilted regiments served on the island in this period. The Seaforth Highlanders were the first to arrive in April 1897, leaving in November that year; the Cameron Highlanders arrived in May 1902, leaving in March 1903. If the highland soldier is, as he appears to be from comparison with other photographs, a piper in the Cameron Highlanders, then the cards probably date from sometime after early 1902. But then again, it wouldn’t be the first time I got it all wrong! This entry was posted in European Intervention Crete and tagged European Intervention Crete, Greek army, International troops on March 30, 2015 by Mick McT. 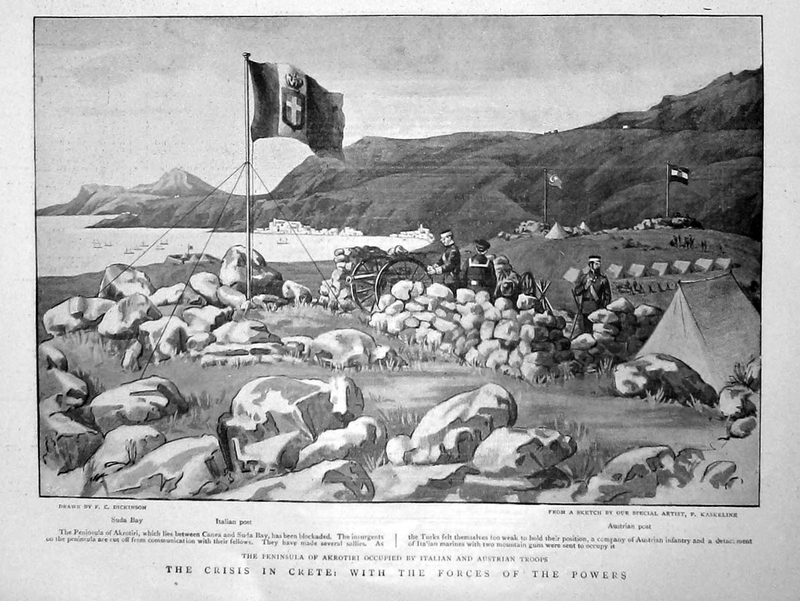 “The peninsula of Akrotiri occupied by Italian and Austrian troops. 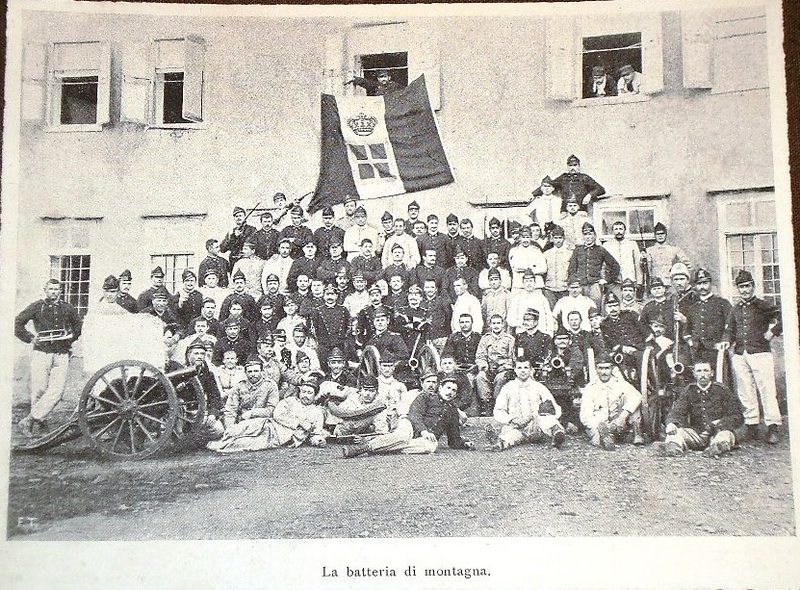 Italian mountain battery. 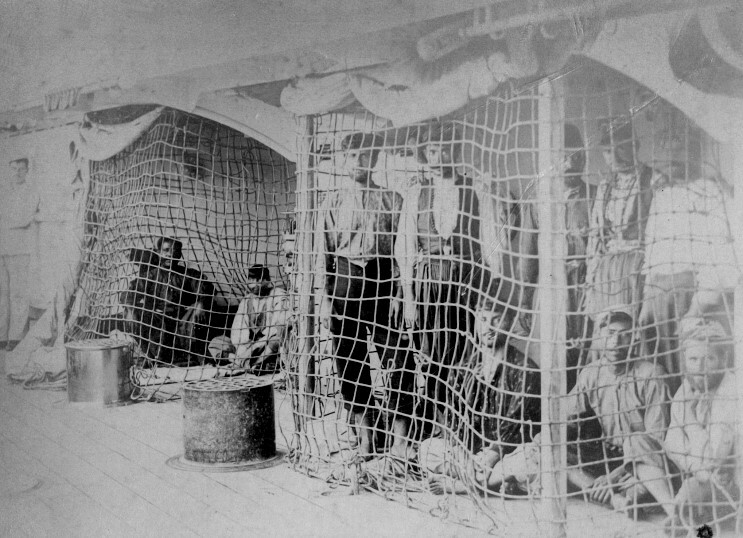 Crete, 1898. 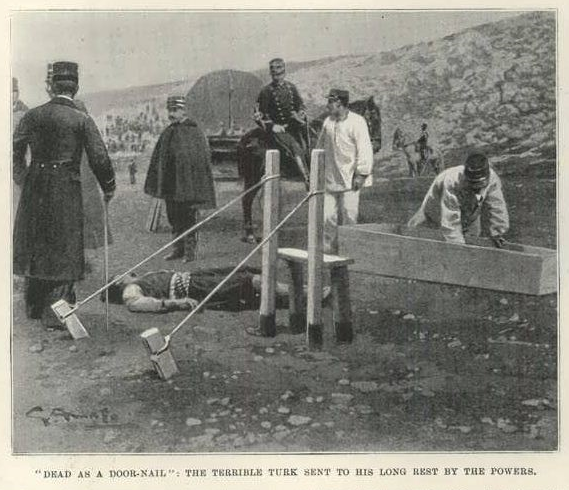 British artillery were represented by 4th Mountain Battery, Royal Artillery, on the island from 26th April 1897 to November 1897. 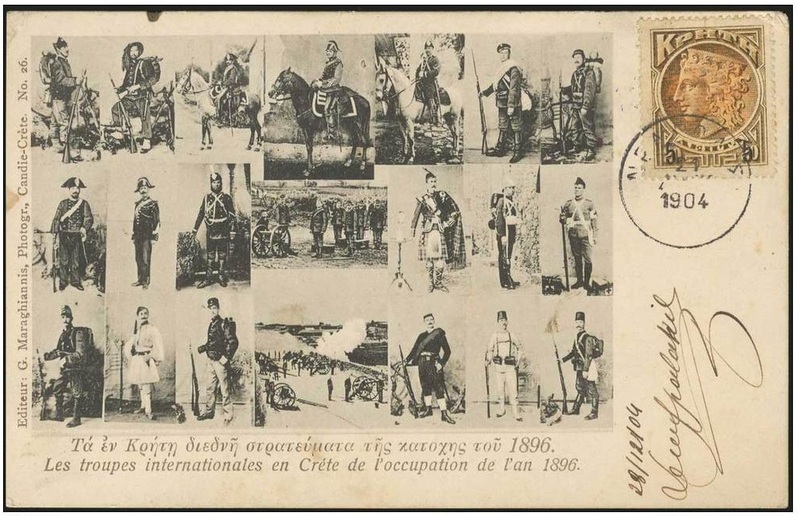 This entry was posted in European Intervention Crete, Uncategorized and tagged Austrian Troops, Crete 1897, European Intervention Crete, International troops, Italian troops, Royal Artillery on March 20, 2015 by Mick McT. 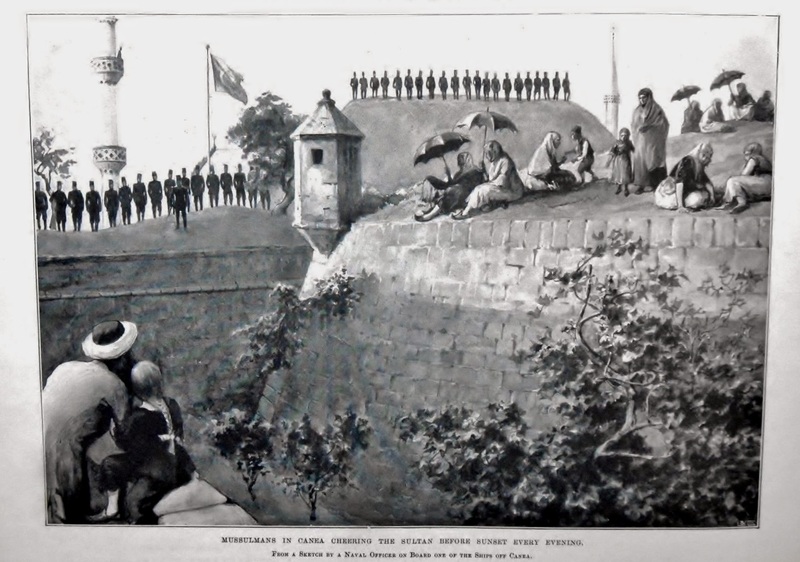 The caption reads: Musslemans in Canea Cheering the Sultan before sunset every evening. Excerpt from: Scenes in the thirty days war between Greece and Turkey, 1897. This entry was posted in Ottomans in Crete and tagged Canea, Crete 1897, Ottomans in Crete on March 14, 2015 by Mick McT. An interesting souvenir, but of what, and where was the photograph taken? 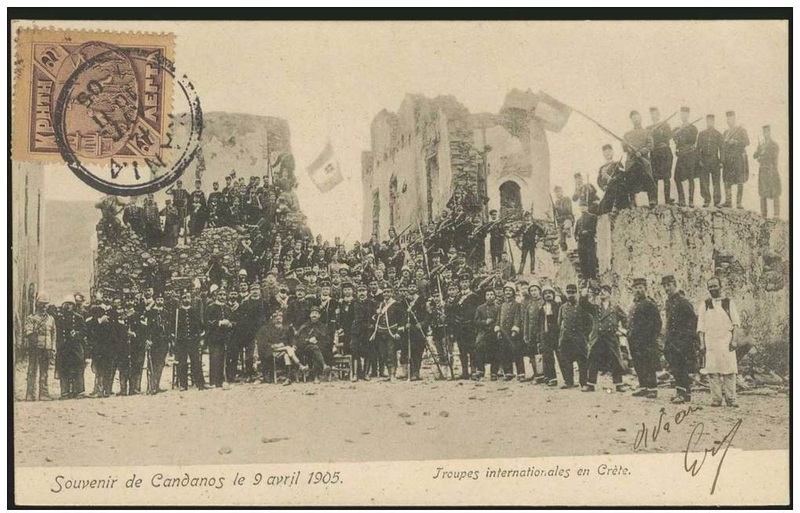 The photograph shows the flags of France and Italy flying above the ruins of some very large buildings. Included in the picture, along with French and Italian troops, are a number of British soldiers (extreme left of picture). There can also be seen what seem to be Cretan Gendarmes or members of the Cretan Civic Guards (on top of the wall top right). The presence of the Cretan Gendarmes/Civic Guards would date the photograph as being taken sometime after 1899, and the arrival of Prince George of Greece as High Commissioner for the island in late 1898 and the subsequent setting up of these two Cretan law enforcement bodies. The problem is that the village of Kandanos is some 55 km south west of Canea and in 1905 was in the secteur controlled by Italian troops – the French and British would have no reason to be there, and judging by the weapons carried, they weren’t there for a holiday outing! The other problem with the photograph is that Kandanos was, and is, a large village, not the sort of place likely to have three-story buildings. The only place where French Italian and British troops are likely to have been in close proximity at around this time, and contained ruins of large buildings, would have been Canea, which as the capital of the island was under the control of all of the four Powers. 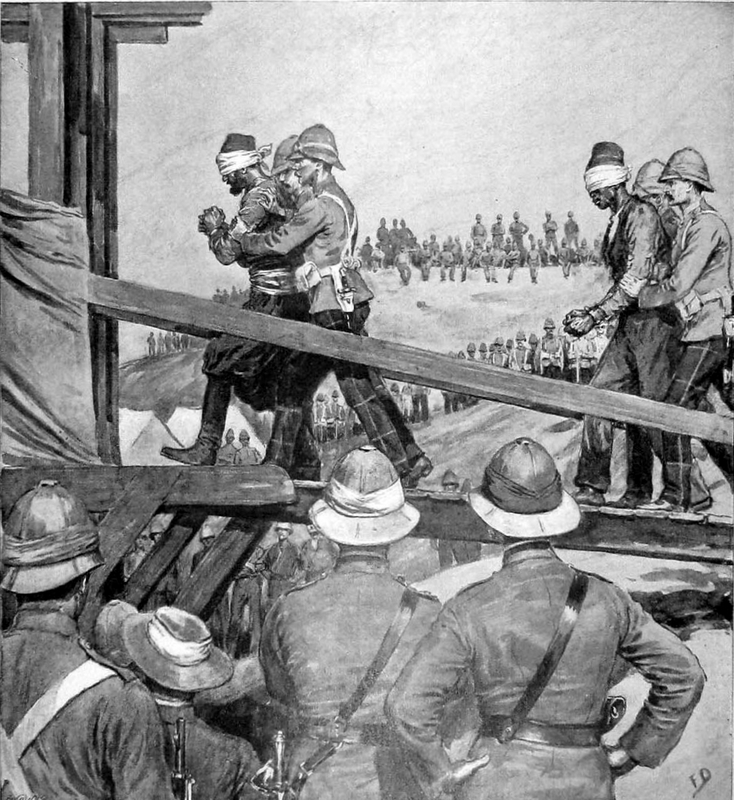 Although Kandanos featured in the world’s press briefly in 1897 when a relief column consisting of international marines and sailors was sent to rescue Ottoman troops and Cretan Muslims besieged in the town by Cretan Christians, no record of anything significant happening there in April 1905 appears to exist – at least not in English. The Theriso Revolt lead by Eleftherios Venizelos had broken out the previous month, but by and large military activity was confined to the Russian secteur of the island, around Rethymnon; little of any import seems to have happened in Selinos, the province in which Kandanos is situated. At the moment I’m completely baffled as to why such a souvenir should be have been produced showing as it does a specific date on which nothing much seems to have happened, and a very misleading location. Any suggestions as to what’s going on will be most gratefully received! This entry was posted in British Army in Crete, European Intervention Crete, French troops and tagged French Troops, International troops, Italian troops, Kandanos on March 9, 2015 by Mick McT. The Graphic 20 December 1898. No details have been found of the quantity or quality of champagne consumed. 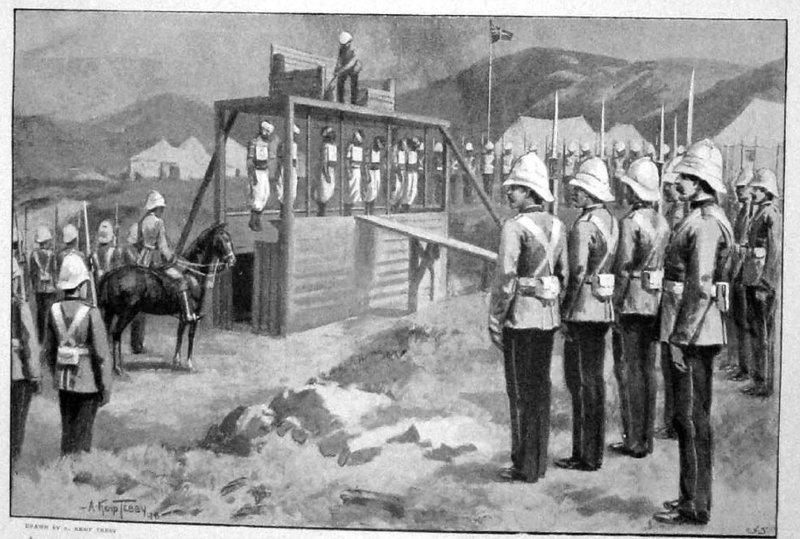 Cretan Muslims within Candia by the British had been disarmed within days of the Candia massacre of 6th September, a process that produced some 5,356 firearms of which 1,576 were deemed to be the property of the Ottoman Government, and the final Ottoman troops had been thrown off the island by 5th November. The problem remained with the Cretan Christians whose leaders had made it clear to Chermside that infighting within the Christian community could preclude disarmament taking place. 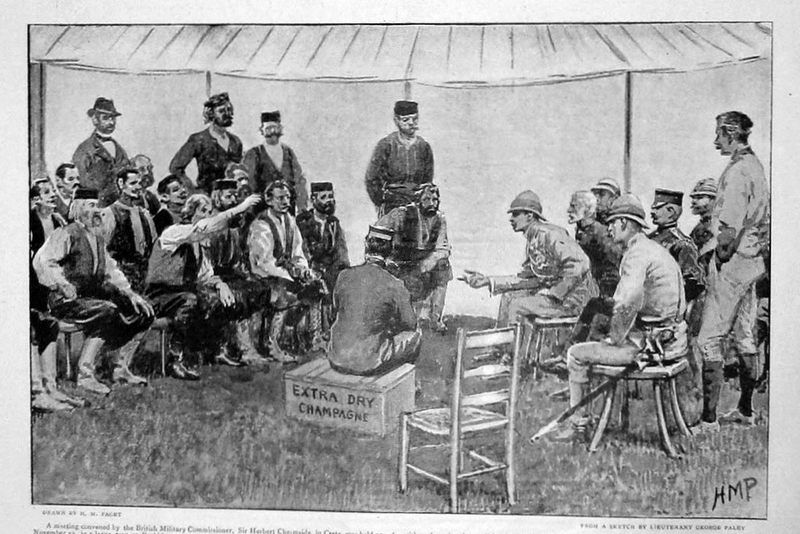 The mistrust between the political factions of the Christian community, and the suspicions of the Christian leaders that any Cretan Christian administrators would act in a partisan fashion, was so great that only the presence of ‘neutral’ British troops in the countryside could induce the chieftains to instruct their followers to surrender their arms. *National Archive. FO78/4969. Page 230. Chermside to Rear Admiral Noel, 6th December 1898. Inclosures 1 & 2 in No. 1. This entry was posted in British Army in Crete, Cretan Rebels, European Intervention Crete and tagged Consul Biliotti, Crete 1898, Herbert Chermside, Major General Herbert Chermside, Sir Alfred Biliotti on March 8, 2015 by Mick McT.